Published: June 2007. Last Updated: May 2011. 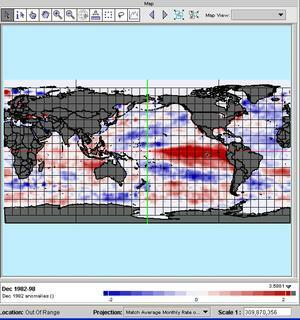 SST anomalies for December 1997 displayed in My World GIS™. Red indicates above average temperatures compared to average SST temperatures for December data averaged over the years 1982-1998. This chapter introduces you to normal seasonal sea surface temperature (SST) variation as well as extreme variation, as in the case of El Niño and La Niña events, in the equatorial Pacific Ocean. 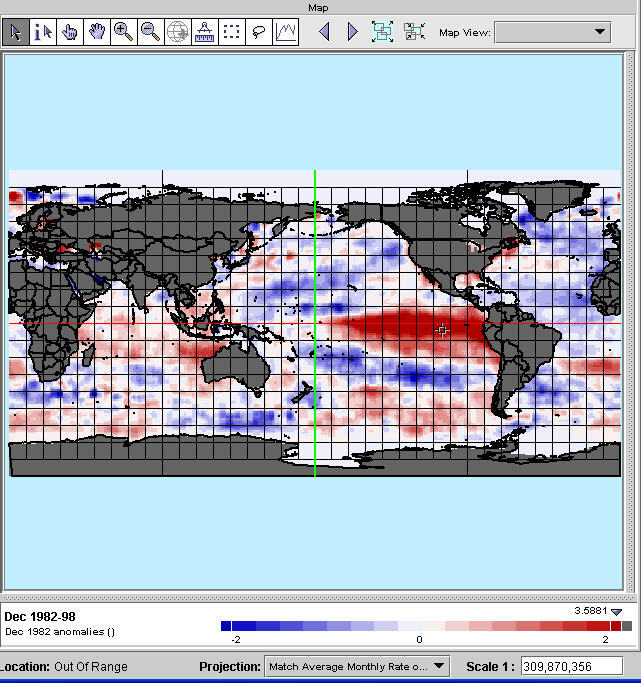 You will learn how to download seasonal SST data from the Pacific Marine Environmental Laboratory (PMEL), via a THREDDS server, for the years 1982 to 1998. With My World GISTM, you will visualize and analyze that data, looking for the tell-tale SST signature of El Niño and La Niña events that occurred during that time period. At the conclusion of the chapter, you will be given the opportunity to analyze a season of your own choosing to determine if an El Niño and La Niña SST pattern emerged in that year's data.